For two weeks in March, volunteers from all over the country swarmed the Ninth Ward for Historic Green's annual Spring Greening event. 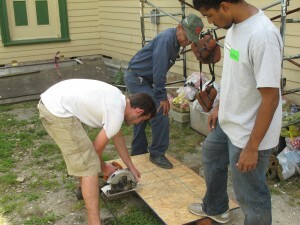 Global Green teamed up with Historic Green to lead volunteers in weatherizing homes for New Orleans residents. Our own tech team of Andrew Spaulding, Cody Wero, and Al Wilson helped teach proper duct-sealing, air-seal leaky floors, and perform amazing feats of flexibility to traverse treacherous attics. Over the course of the two-week event, Global Green led work on the homes of Joseph Bernard, Shirley Charlot, and Ernest Taylor. Each of the homeowners had no shortage of stories to share with the volunteers and crew leaders. Shirley Charlot's tales of dealing with contractor fraud and damage done to her home made the work all that more important, while Mr. Taylor's enthusiasm and willingness to chat about anything kept volunteers entertained as the retired HVAC contractor worked side-by-side with them. One of the great things about the Spring Greening event was the diversity of the volunteers. College freshman from NYU weatherized homes alongside utility workers from Kansas. People came from all over the country to help make this historic community a more sustainable place. In addition to teaching and leading teams, Global Green staff connected Historic Green with local materials from St. Claude Community Hardware, performed quality assurance and diagnostic testing on the homes, and gave tours of the Holy Cross Project to volunteers. Not only did the Spring Greening help homeowners in the 9th Ward make their homes healthy and energy-efficient, but it also sent volunteers home with an awareness of the challenges New Orleans faces and how their own communities can learn from the work we've done to overcome them.